Our May 22 auction of Contemporary Art features a selection of recent sculpture and multiples by some of the world’s most famous living artists. Here are a few of our favorites. Lot 385: Ai Weiwei, The Artist’s Hand, electroplated rhodium on cast urethane resin, 2017. 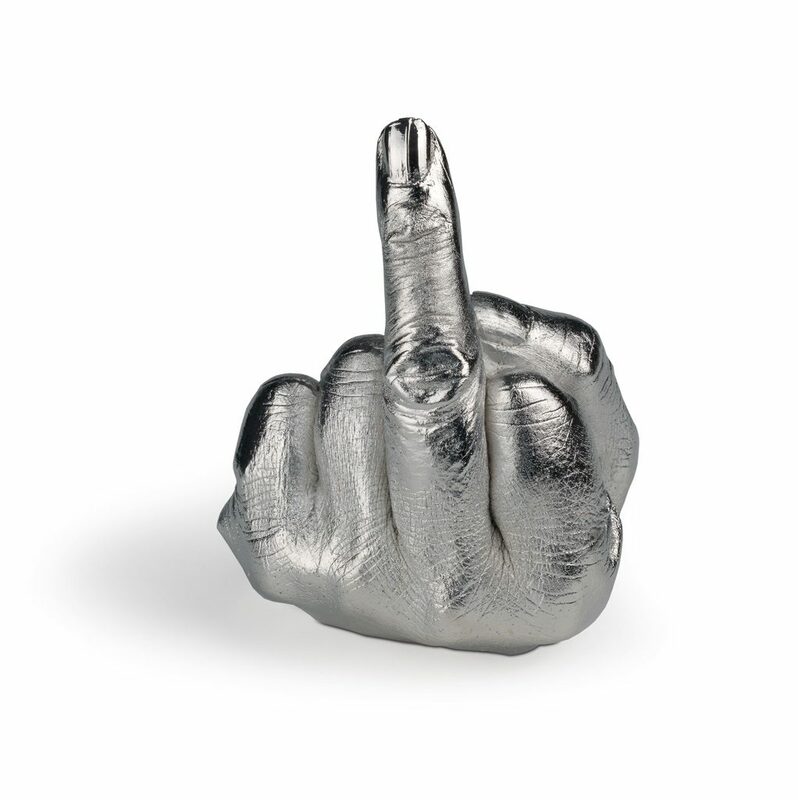 This cast of marquee artist and world-renowned human rights activist Ai Weiwei’s hand making a rude gesture was one of 1,000 created and sold in 2017 to support the artist’s public exhibition Good Fences Make Good Neighbors, which was installed in 300 locations throughout New York City from October 2017 to February 2018. The work references a popular photographic series by the artist, Study of Perspectives, in which he traveled to government buildings around the world and gave them the finger. 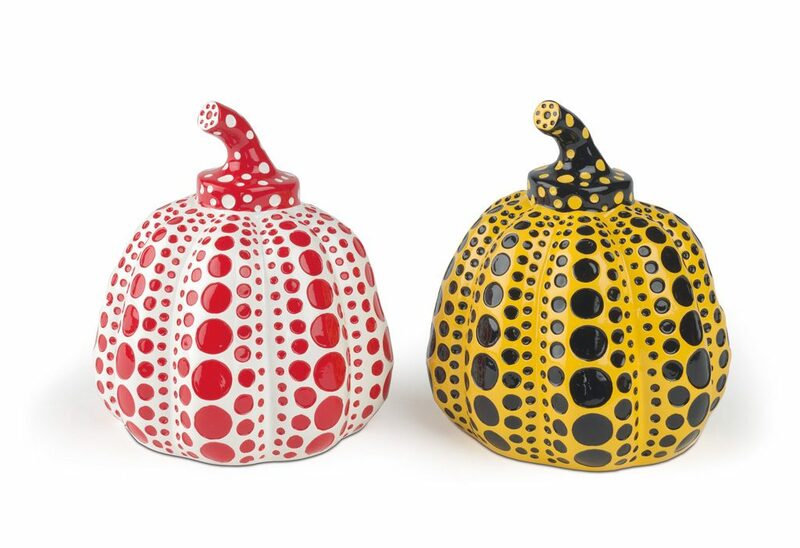 Lot 384: Yayoi Kusama, two Pumpkins, cast resin, in original boxes, 2013. Estimate $1,500 to $2,500. Lot 377: Kehinde Wiley, After La Negresse, 1872, cast marble dust and resin, 2006. Estimate $4,000 to $6,000. 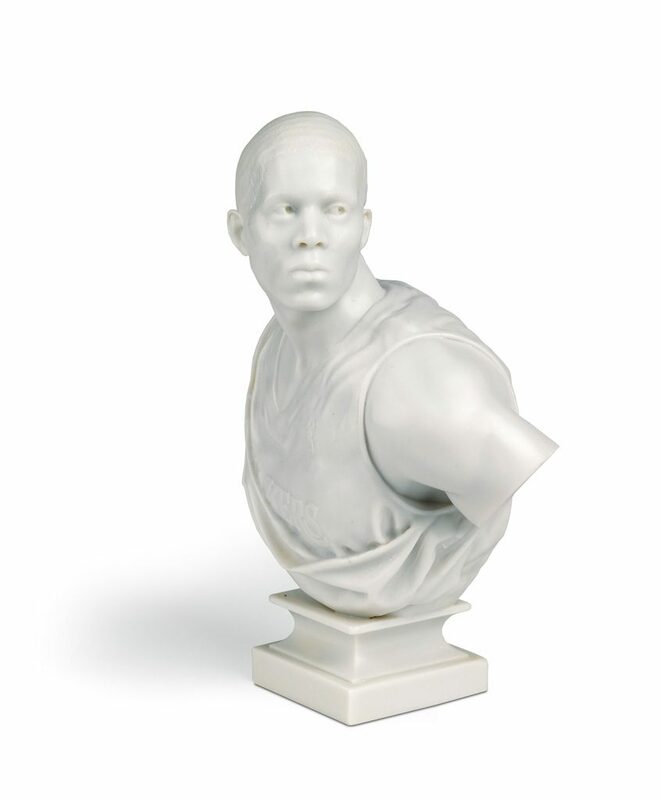 Kehinde Wiley collaborated with Cereal Art in 2006 to create a series of cast marble busts recreating specific historic works. After La Negresse, 1872, references a bust by the nineteenth-century French sculptor Jean-Baptiste Carpeaux, replacing the original female slave figure with a young male basketball player. 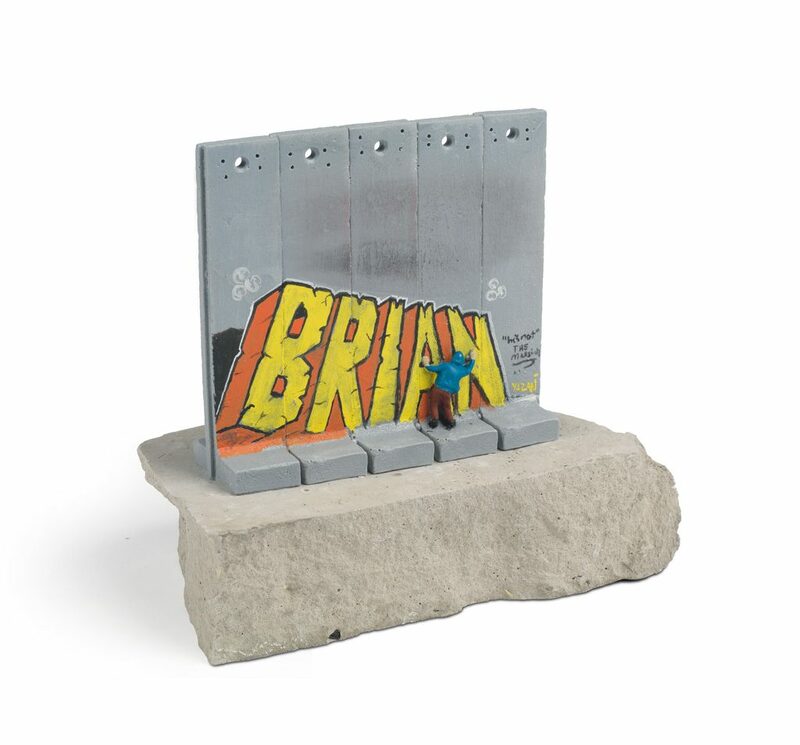 Lot 365: Banksy, Walled Off Hotel — Box Set, framed color print and hand-painted model with concrete base, 2017. Estimate $1,500 to $2,500. In September 2017, anonymous street artist Banksy opened a gift shop in his “Walled Off Hotel,” overlooking the border wall that bisects Bethlehem between Palestine and Israel. In typical Banksy fashion, the hand-painted pieces offered at “Wall Mart” highlight social issues by turning the tools and infrastructure of oppression into a capitalist venture. Robert Norton, inventor of Norton Antivirus Software, gives the best Christmas presents. 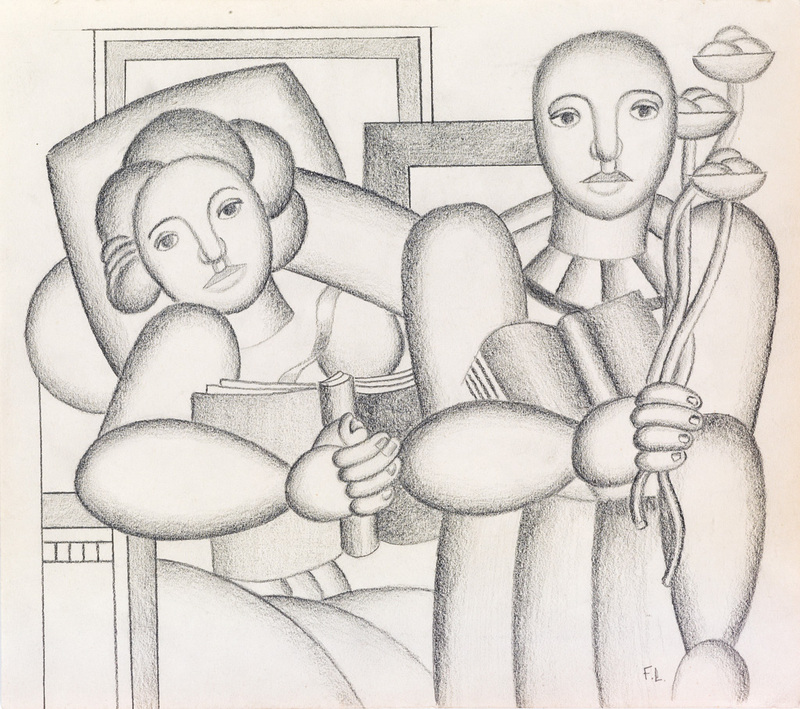 Each year, he commissions a contemporary artist to create a work to be sent to everyone on his gift list. The project has been going since 1988. Three examples of the gifts will be offered in this auction. Lot 375: Takashi Murakami, Oval (Peter Norton Christmas Project), colored plastic, vinyl, mini CD, 2000. Estimate $2,000 to $3,000. Lot 369: Robert Lazzarini, Teacup and Saucer, set of two porcelain cups and saucers with metal spoons, 2003. Estimate $1,000 to $1,500. Robert Lazzarini is best known for his sculptures that subvert everyday objects in order to complicate viewers’ expectations and ideas of perception. To create Teacup and Saucer, Lazzarini drew the cup and saucer using three-dimensional modeling software, and laser scanned a normally-proportioned spoon into the computer. He applied a series of wave patterns along these models to create the finished product, which evokes a surrealist, otherworldly quality. For his gift with the Norton Christmas Project in 2003, Lazzarini sent one of these teacups to everyone on Norton’s list. Included in the design is a small chip on the rim of the teacup, intended to give the impression that each had a previous life as a useful object. Lot 378: Kara Walker, Freedom: A Fable: A Curious Interpretation of the Wit of a Negress in Troubled Times, bound pop-up book, 1997. 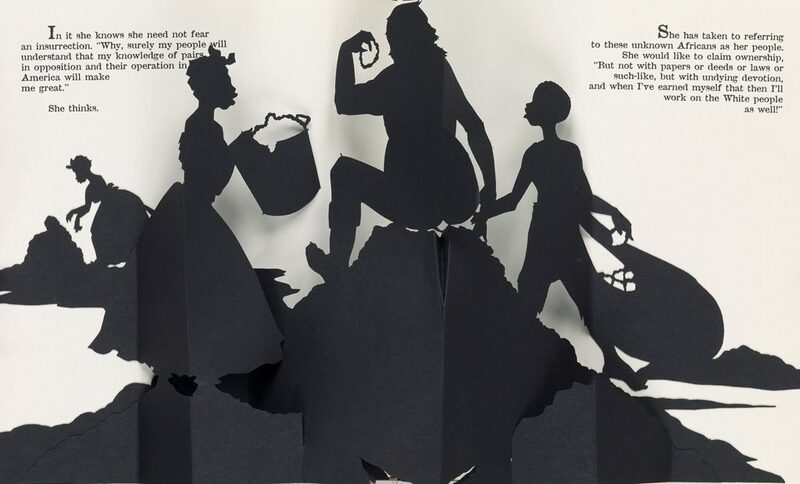 Kara Walker’s 1997 contribution to the Norton Christmas Project was an elaborate pop-up book, which details the dreams of a woman in the antebellum South about to be freed from slavery. She fears she will be sent to Liberia after the Civil War, and decides instead to become a god. The nature of the pop-up book, a medium usually reserved for children, belies the theme of the plot. According to Walker, Toni Morrison was one of the recipients of the Christmas gift and sent her a personal thank-you note.